Spirits are souls, the source of a person’s consciousness and emotions. Descartes characterised spirits as ‘thinking things’. Spirits aren’t solid or blocky like material bodies. Spirits are immaterial. Most Judaeo-Christian systems believe our spirits will survive bodily death. In the afterlife, our spirits will join God, an eternal and infinite spirit. Spirits seem quite different from human bodies, teapots, or trees. This led philosophers to ask, “Are spirits in space?” Until the 17th century, thinkers generally held one of two theories. Nullibism claims spirits do not exist in space. Spirits are utterly unlike human bodies or trees, and they are non-spatial. An attraction of this view is its simplicity: spirits aren’t in space, end of story. A problem with this view is that some spirits do seem to be in space: your soul seems to be where your body is. When my body walks to the grocery store, my spirit goes with it. When my body gets on a train to Paris, my spirit goes to. If my body is in London, I can’t send my spirit to New York. Holenmerism claims spirits do exist in space, yet in a very different way to bodies. Consider a particular body, a tree. Its parts are ‘spread out’ through space: the roots are under the ground, the trunk emerges in one place, and its leaves are spread through different places in the air. In contrast, holenmerists believe a spirit is not spread out through space. Even though your spirit is ‘in’ your whole body, your spirit doesn’t have parts. The whole of your spirit is in each part of your body, so your whole spirit is in your left little finger and your heart and your nose. The attraction of holenmerism is that it explains why your spirit seems to be where your body is: your spirit is where your body is. Your spirit co-exists in space with your body. The problem with holenmerism is that it is difficult to understand, and sounds downright strange. Nonetheless, holenmerism was defended by many philosophical greats, including arguably Plotinus, Augustine, Anselm, Aquinas, Descartes, and Newton. Consequently, it came as a shock in the 1650s when holenmerism was vociferously attacked by English philosophers. One critique came from Thomas Hobbes’ 1651 Leviathan. Hobbes ridiculed the ‘absurdities’ of holenmerism, the idea that a man’s whole soul can be ”All of it in his little Finger, and All of it in every other Part of his Body”. Hobbes’ attack didn’t come as too much of a surprise. Hobbes was once described as a ‘confident Exploder’ of spirits out of the world: he famously denied the existence of spirits, including arguably God. What did come as a surprise was the critique from Henry More, a devout Christian. In his 1659 Immortality of the Soul, More argued holenmerism is a ‘mad Jingle’, verging on ‘profound Nonsense’. Unlike Hobbes, More didn’t use anti-holenmerism arguments to deny the existence of spirits. Instead, More got creative. More reasoned, but you can’t chop off a piece of my soul. More compared spirits to light. Just as sunlight spreads through a forest yet can’t be divided, so a spirit spreads through a body yet can’t be divided. More’s 1671 Enchiridion Metaphysicum rejects nullibism and holenmerism (More actually invented these labels in the course of making his arguments.) The book describes these theories as ‘two vast mounds of darkness’, and sets out a new, alternative third theory. More believes spirits do exist in space, yet he can’t stomach holenmerism. Where does that leave him? More argues spirits exist in space, in a way quite similar to how bodies do. Like bodies, spirits are spread out through space. One part of my soul is in my heart, and another part is in my nose. The difference between the parts of a spirit, and the parts of a body, is that the parts of a spirit cannot be separated from each other. You can chop my finger off, More reasoned, but you can’t chop off a piece of my soul. More compared spirits to light. Just as sunlight spreads through a forest yet can’t be divided, so a spirit spreads through a body yet can’t be divided. This new theory provided More with a sensible way of explaining how human spirits co-exist in space with bodies. Ultimately, this led him to a new account of space. More was coming to believe that space was ‘absolute’: infinite, eternal, and real. If you were listing The Contents of the Universe, space would be on it. Yet, the devout More worried, how could anything other than God be infinite, eternal, and real? His solution lies in the fact that God, an infinite and eternal spirit, is spread out through space. If God and space are infinite and eternal, and God is spread through space, perhaps God is space. More concluded that space is God’s immensity or presence in the world. Similarly, time or duration is God’s eternity. More’s theory of how spirits exist in space didn’t catch on, but his absolute theories of space and time did. They were taken up by all kinds of thinkers, including arguably John Locke, Samuel Clarke, and Newton. Although these absolute space and time theories have evolved, their descendents are still widely held today. Although these absolute space and time theories have evolved, their descendents are still widely held today. Amongst other things, More’s theory of time is responsible for changing the way Europeans perceived mountains. I don’t know whether spirits exist, although I lean towards Hobbes’ view we should explode them out of the world. I do know that, archaic though these debates sound, they are crucial to understanding the history of our space and time theories. Featured image credit: Forest, wilderness, ray and sunlight by Timothy Meinberg. Public Domain via Unsplash. Emily Thomas is Assistant Professor of Philosophy at Durham University. 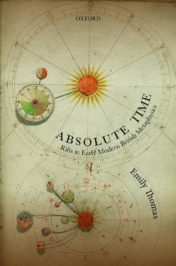 She is the author of Absolute Time: Rifts in Early Modern British Metaphysics, published by Oxford University Press. I had an experience of waking up to use the restroom in the middle of the night. Opened the door left the light off and saw a tall man looking down and then turning his head towards me. I shut the door and said, “Sorry Skye”. He was a friend staying over. I then realized the figure was too tall to be Skye so I opened the door turned on the light screaming at the intruder-who wasn’t there. I realized what I saw was a spirit. I had a beginner’s mind waking up. No interpretation. Empty. I am a firm believer of another dimension where things “live”. I only saw it because I wasn’t looking for it. Space and time, and space time are so complex that most people, including me, can not get their minds to even partially comprehend. Thanks for sharing this article. I found it interesting. Hobbes did not deny the existence of spirits nor did he deny the existence of God. He wrote an entire treatise on how spirits are distributed through space. See Hobbes, “An Answer to a Book Published by Dr. Bramhall”.